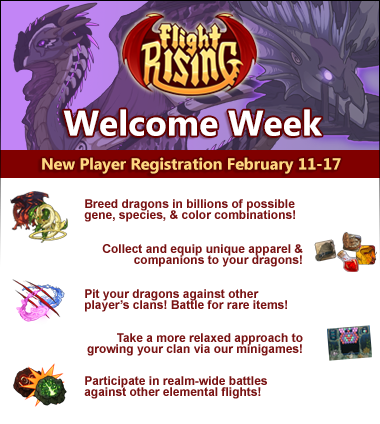 Flight Rising is now open for new registration for our monthly welcome week! A big welcome to all of our new players! Click here to read more about today’s update. If you encountered any issues while registering, please send our Support staff a message through Contact Us. Ready to get started? Click here for our help center, a quick primer on account information! Want to know more about the lore, features, and items of Flight Rising? Click here to visit our encyclopedia! New players, if you don't see your registration email, please check your spam folder. Hotmail/Outlook Customers: Delivery to MSN domain e-mail accounts seems to be hit and miss for Flight Rising registration e-mails. Please use a different e-mail address to sign up if possible. If you have registered with an MSN domain e-mail address and were unable to complete your sign up process, please contact us to resolve your issue. PLEASE NOTE: Use of the Flight Rising website and forums constitute agreement to the above rules and policies. Threads are moderated and accounts actioned as needed, as laid out by our rules. Every night, at 00:00 server time, the site is inaccessible for approximately thirty minutes. This is our maintenance period. Rollover resets your dailies. What exactly is “server time”? The Flight Rising website runs on a 24 hour clock and is set to the Pacific time zone. Our clock recognizes Daylight Savings which means the server time will alternate between UTC-7 and UTC-8 accordingly. The server time is displayed in the upper left of every page. I need customer support, what do I do? If you need staff assistance or would like to submit feedback, send our Customer Support team a message through Contact Us. How can Customer Support help me? Tickets are processed based on severity and the order they are received. Tickets submitted without any of the above information may take longer to resolve. What is treasure? What is it used for? How can I get treasure? Exalting your dragons when participating in dominance. Bringing Crim the items she asks for. What are gems? What are they used for? Paypal is currently the only method to purchase gems. We are looking into other methods. We apologize for any inconvenience this may cause. Some players trade treasure for gems or privately trade items for gems but be advised that this is at the player’s own risk. We strongly recommend the use of our Crossroads over promises for any player-to-player trades. Flight Rising does not currently support these types of transactions and our Support staff will not be able to assist in restoration in the event the promised trade is not completed. You may still report the incident to be actioned. If you purchase gems through Paypal and do not receive them, please send our Customer Support staff a message through Contact Us and include the transaction ID# when you do. Where can I get started in the forums? The Help Center is a great place for new players. Volunteer moderators and forum regulars are ready and waiting to help answer your questions. Check out the stickies, read through the forum, and don’t hesitate to ask a question! Another great forum to check out is the Introductions Forum! Get to know your fellow players and even a little bit about the volunteer moderator group! If you’ve found a bug, the Bug Reports Forum is where you want to go. Our software engineers review the forum daily. While you may not receive a personalized response to your report, please know that all reports are documented. Yay, welcome to any newcomers~! Please check out my threads!